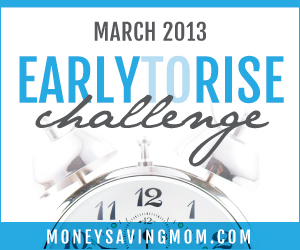 This is day 12 of the Money Saving Mom Early to Rise Challenge! I took a couple weeks off. It was both longer than I intended to, and hardly something I intended to do at all. 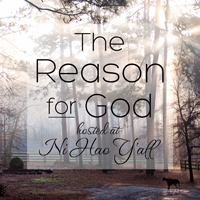 I had wanted to blog while we were on our trip, but that never worked out. So I thought I'd wait til we got home. I never realized how tired I would be when we made it back. All I wanted to do was sleep and give myself a little time to get back into the swing of things. So, I thought I'd start yesterday. That ended up a "failure" day. All of this to say, I'm here now! Thank goodness. It feels so good to be back in somewhat of a routine. Don't get me wrong. We had a wonderful time while we were out and away. Can I tell you visiting GA makes me want to stay there? Buy a little house? But travel threw all of us off our routine, most of all D-baby. He started showing signs he was done about halfway through the trip. And he's still struggling a bit with being home now. Things are getting better day by day. Can you tell we don't travel too much? I liked the passage today about NOT going with the flow. I've never personally been one to "flow" much, but never thought about why. I'll agree with the author that this is getting difficult because it's new territory. I'm going to keep reminding myself what I tell my daughter sometimes. "Just because something is hard doesn't mean you shouldn't do it." Onward I strive. But not going with the flow in order to slow down is a new concept. I've only thought "going against the flow" was how you not go with the flow. But, it's "slow, not flow" that I'll have to think on about how to execute. I like the concept. Sometimes going against the flow is too much work! So, what time did get up? 5:42 according to the clock. I feel pretty good right now, but will likely need a nap or something by the early afternoon. Will post a picture as soon as I can find the camera usb cable. Still hoping to do a post on D-baby's birthday. Hope to find the time soon! A question before you go: How do you "slow, not flow"? I need ideas! Thank you for inspiring me to buy the book. It's my second week and reading your blog made me change my life! Thanks for buying a copy! You helped feed my kids. And they eat a lot.